Start by adopting an attitude of encouragement for yourself and others. Many of us have set goals for the new year. That’s a great idea because we are more likely to achieve our goals when we take the time to be specific about what we hope to accomplish. The problem is that we are so often too hard on ourselves when we get off track. So make it one of your goals to give yourself a break and focus on an attitude of encouragement. Next, smile. A smile is one of the easiest things to share. Not only will it help others feel better; it will help you feel better too. A smile can be just as important as words when it comes to encouraging yourself or someone else to keep trying. Let your smile be an inspiration. Finally, share kindness. It’s normal to get caught back up in the rush of daily life and forget the feelings of good will that surrounded us just a few weeks ago. Make it a point to spread kindness everywhere you go. And remember to share that kindness with yourself. 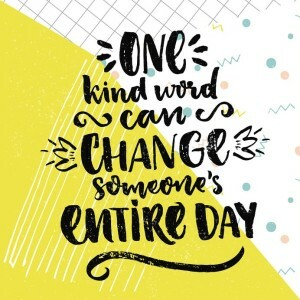 It can change your whole day! Keep the holiday spirit going! Be kind and encouraging to yourself. Then spread it all around.